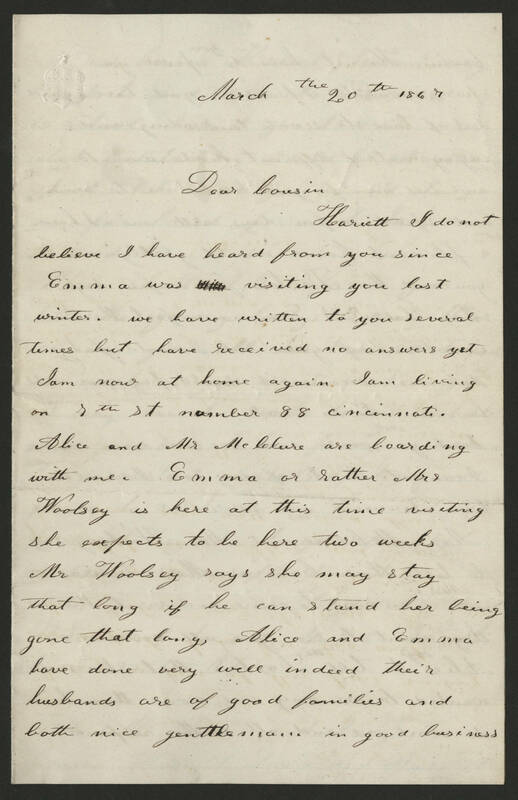 March the 20th 1867 Dear Cousin, Hariett I do not beleive I have heard from you since Emma was visiting you last winter. we have written to you several times but have received no answers yet I am now at home again I am living on 7th St number 88 Cincinnati. Alice and Mrs McClure are boarding with me. Emma or rather Mrs Woolsay is here at this time visiting she expects to be here two weeks Mr Woolsay says she may stay that long if he can stand her being gone that long, Alice and Emma have done very well indeed their husbands are of good families and both nice gentleman in good business.